When I was making my wedding registry, my sisters wisely advised me not to register for the typical spice carousel/caddy. I agreed that it would indeed take up too much of my precious counter space and might have spices I would never use (i.e. allspice, which takes me back to fancy Chinese dinners where it was never used in moderation and you tasted/burped up allspice for the rest of the night). On the other hand, I do not like my mom's spice cabinet. All of the canisters are different sizes and are a huge mess. I can never find what I need and usually end up taking half of them out to find the cinnamon. 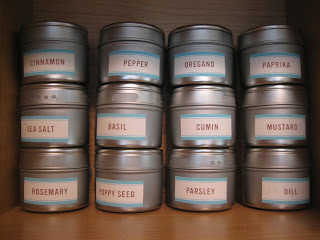 So I decided to avoid both of these less-than-ideal situations and register for a ton of these magnetic spice tins. I could fill them with my spices of choice and have an organized, uniform spice cabinet. Which is definitely necessary for an OCD-prone person, like myself. 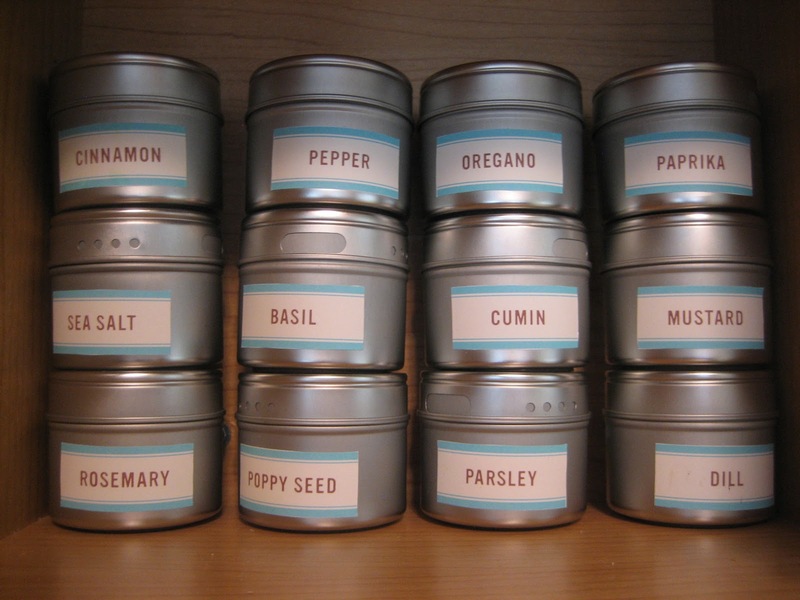 To top it off, Martha Stewart offers these cute spice labels that you can print onto adhesive paper and stick right on to your spice tins. My spice collection is still growing, as I only buy additional spices when new recipes call for them, but I love that I only have what I need and I can easily grab the right one in the moment. As I have more cabinet space than drawer space, I opted for the labels to go on the side of the canister rather than on top. A great alternative that I recently read about is this spice carousel that you can mount underneath your cabinet. Pro: There's a dial that with each turn it dispenses 1/4 tsp of the spice out. Con: It is pre-labeled so you're still stuck with allspice. safe to say I think I will be putting these on my registry, great idea!